The ParkPilot uses ultraound sensors to determine the distance between the front and rear bumpers and an obstacle. Up to 6 ultrasound sensors for the ParkPilot are located in both the front Aand rear B bumpers (arrows). The intermittent and permanent acoustic warning signals for the front ParkPilot are of a higher pitch than those for the rear ParkPilot. This is a standard feature. The warning signals can be adjusted in the infotainment system menu . Switching on the ParkPilot manually. Press the button once. Switching off the ParkPilot manually. Press the button again. Switching off the ParkPilot display manually (sound output remains active). Press a function selection button on the factory-fitted infotainment system. OR: touch the X function button. Switching on the ParkPilot automatically. Select reverse gear or move the selector lever to position R.
OR: depending on the vehicle equipment level, when the vehicle rolls backwards. OR: slowly driving towards an obstacle located in the front area of the vehicle path display at a speed lower than 10 – 15 km/h (6 – 9 mph). The obstacle is detected at a distance of approximately 95 cm when automatic activation is switched on in the infotainment system. The mini ParkPilot display is shown. Switching off the ParkPilot automatically. Move the selector lever to position P.
OR: accelerate the vehicle to a speed greater than approximately 10 – 15 km/h (6 – 9 mph). Temporarily muting ParkPilot: Touch the function button. OR: close the electronic parking brake. The obstacles will be displayed in grey for as long as the electronic parking brake is switched on. Changing from mini ParkPilot display to full-screen mode: Press the button once. OR: select reverse gear or move the selector lever to position R.
OR: touch the mini ParkPilot function button. Switching to the reverse assist system camera picture as required. Select reverse gear or move the selector lever to position R.
OR: touch the function button. The indicator lamp in the button lights up while the function is active. 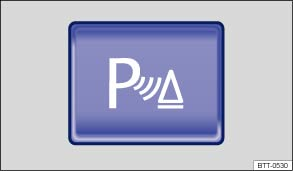 During automatic activation of the ParkPilot, a mini ParkPilot is displayed on the left-hand side of the screen . If the vehicle is accelerated to a speed greater than 10 – 15 km/h (6 – 9 mph) and then drops below that speed again. OR: if the electronic parking brake is closed and then released again. OR: if the selector lever is moved to position P and then out of that position again. OR: if automatic activation is activated and deactivated in the infotainment system menu. Automatic activation with mini ParkPilot display can be activated and deactivated in the infotainment system . When automatic activation is activated, acoustic signals are sounded from a distance of approximately 50 cm from the obstacle. Failure to observe the illuminated text messages can lead to the vehicle being damaged.